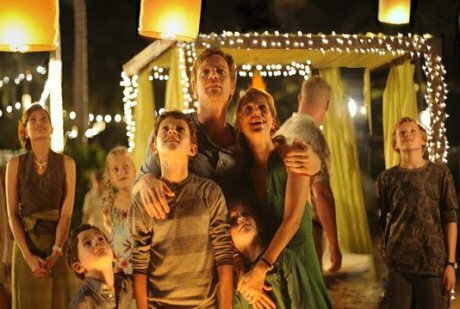 Careful to open the film with the apropos gravity of real life tragedy, denoting that the chaos about to unfold is based on a true story that occurred during the 2004 Boxing Day Tsunami, The Impossible sets itself up as a severe fable of the human spirit. Much like the many films made about recent events, such as the World Trade attacks, London Subway bombings or anything pertaining to Katrina, there's a humourless air of sanctimony that vacillates between maturity, dignity and self-importance. Initially, Juan Antonio Bayona's (The Orphanage) biopic disaster movie doesn't stray far from the template, featuring the happily married Maria (Naomi Watts) and Henry (Ewan McGregor) taking an Indonesian Christmas trip with their three precocious and precious sons. Henry worries about the future of his career, which leads Maria to question whether she should go back to working as a doctor, while the oldest son Lucas (Tom Holland) waxes surly with bashful younger brother Thomas (Samuel Joslin). And since these characters are based on an actual British family, they're all exceedingly syrupy-sweet and affable in a way that's not even remotely believable. It's a harrowing and unflinchingly candid sequence of horror that gives the unapologetic impression that anything could happen. Even when things calm down, Bayona refuses to placate the audience with reassuring niceties, instead focusing on the grittiness of the experience, with a seriously injured Maria struggling to maintain control of an unpredictable situation. It's this trip through unfamiliar terrain that ultimately humanizes these characters, stripping their relationship to the bone in removing the litany of social signifiers that keep people from being honest with each other. The power and importance of human connection and survival are paramount and the intense performances from both Watts and Holland make it nearly impossible not to be deeply moved by, and engaged in, their plight and love for one another. Every once in a while the story steps back to comforting contrivance, which denigrates the power and strength of everything that's been built up, but the overall visceral experience of this tale of survival and familial importance compensates for these occasionally clichéd missteps.